Soon enough, however, I was greatly surprised when the goods line was closed. I would later find out that they had moved the goods to the side and had changed the whole stand. One of the things I’ve been noticing in VAMPS events this year has been a tadbit of disorganisation. Setting the goods blocking the entrance was not a smart move, and one that I feel would be repeated later on. 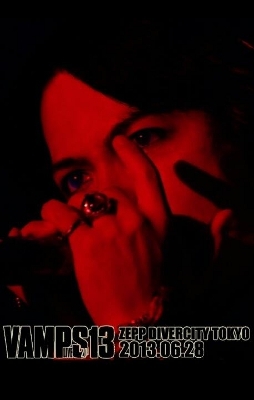 Earlier that afternoon, Hyde had announced that VAMPS fans, usually known as “VAMPSAddicts”, would thereby be called “Bloodsuckers”, which is an interesting word when he is trying to pronounce it. Even though we got a late entry ticket, we managed to get a good spot, and the concert kicked off at 19:06, which in Hyde’s twisted little mind is 6:66. Who would have thought. It called my attention that the concert was a bit slow, for what VAMPS has us used to, that Hyde was using his guitar more often than he normally does and that KAZ was not twirling his too much. Later we would find that it was due to the silent one breaking a couple of fingers on his left hand. Not good, KAZ, don’t do that. Both the new songs, Ahead and Replay got played, although I swear that Countdown just must have gone over my head. The concert pace sped up until Ahead, and then it was the kind of live I had been expecting. Randomly, a new word was learnt regarding Hyde’s dancing movements, and that was くねくね (kunekune, “like a wave”), which apparently a group of Japanese fans use, and that describes pretty well how he moves. The MC was rather cute, telling us bathroom-finding trouble in a new venue, and later on there was cake for Ju-Ken, whose birthday was that day, and who had already had had cake the day before. Hyde tried to steal all the attention back from him though, even when we sang Happy Birthday Dear Ju-Ken and all. We also discovered that KAZ has a curling-iron-accident dark past can both talk and do choirs. As in he was singing, people! I was tremendously surprised by Live Wire, but the surprise died off and was soon forgotten as there was Midnight Celebration. It is a bit of a regret of mine that I don’t think I’ll ever get to listen to Shallow Sleep live, but Midnight Celebration ranks #2 on my list from Hyde’s solo times and hey, he has learnt to say I play, you obey instead of I pray, you obey. I really hope one day I can hear him yelling “HELLO! !” too. While I enjoyed second half best, it was a good, fun concert, even if a painful one, as my right hip did not approve of the day’s effort. This entry was posted in English, Showbiz-Entretenimiento, 日本国 and tagged concert, music, Tokyo-Odaiba, VAMPS. Bookmark the permalink.